Summer is almost technically over, but it does not feel like Fall yet in Memphis. I’m using up the last of the peaches on sale in the supermarket while I still can. I had a sweet tooth, so I wanted something decadent but also nutrient dense. 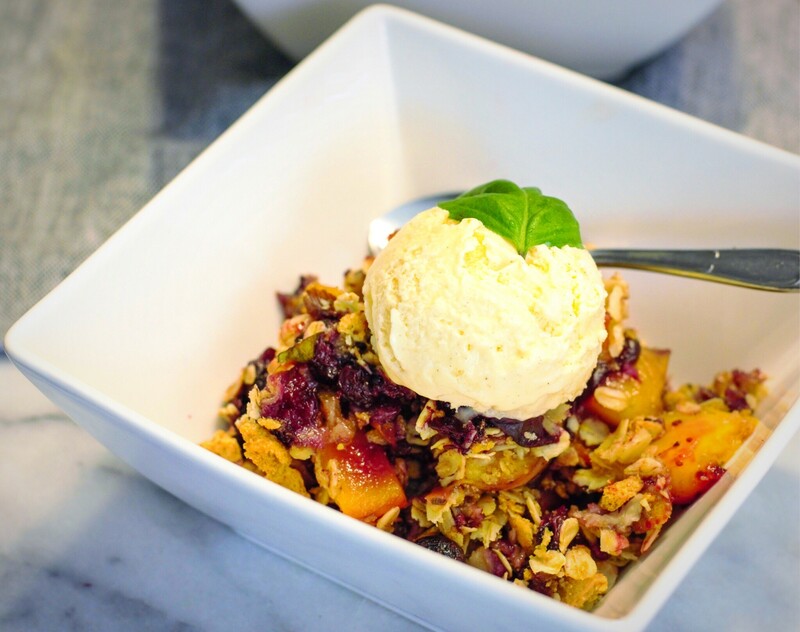 This crisp is full of antioxidants from blueberries and basil, potassium from the peaches, and some whole grain action with the oats in the crisp. Top with your favorite ice cream (you have to have ice cream!) or dairy alternative and enjoy! Preheat oven to 350° F. In large bowl, combine peaches, blueberries, maple syrup and basil. Spread peach mixture into the bottom of a cast iron skillet. Prepare topping by combining crushed graham crackers, brown sugar, oats, butter, walnuts and salt. Evenly distribute topping over peach/blueberry mixture. Bake for 40-45 minutes or until golden brown and crispy. Serve immediately with ice cream.